Oil on canvas, 56,5 x 74 cm. 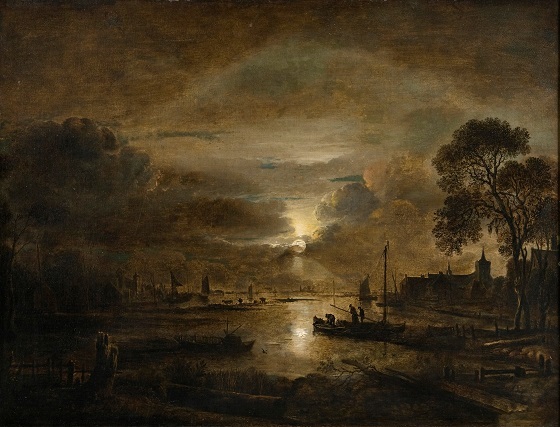 Nocturnal landscapes in moonlight were one of the artist’s specialties and were an expression of a strong Romantic tendency within Dutch painting at the time. Whether it was the light of a setting sun, of the moon or from a fire, concentrated light sources always fascinated Aert van der Neer. Nighttime was a state that opened up the connections and depth of existence. On the low horizon and in the overwhelming sky, the moon appears like the eye of God. The velveteen shadows create a silent evening idyll, while the work simultaneously pulsates with mystery and drama. Although this is a nighttime image, the surface is scattered with light and reflections that enhance the magical atmosphere. Aert van der Neer was born into a family of painters. He specialised in landscapes, where night scenes with backlighting came to characterise his work. He has since become known for his ability to subtly nuance light and shadow, thereby creating a unique impression of atmosphere that is equally characteristic of his landscapes. Van der Neer was part of a movement within Dutch landscape painting that had been in rapid development since the 1620s. Central to the subjects was the focus on the local, Dutch landscape.